The 2000’s have been the most incredible time of my two and a half decades’ worth existence. These last ten years have played the most singularly important part in determining not just who I am today, but also, in all probability, in who I will be (or continue to be) in the next few decades that I hope to remain alive. 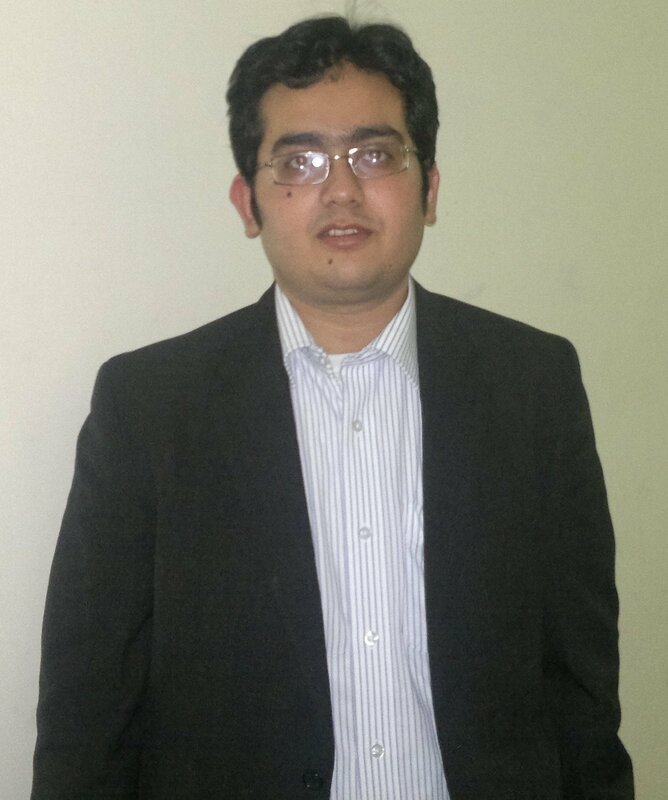 Some of the most memorable things of my life have occurred in these last 10 years – high school, graduation in mechanical engineering, hostel life, my first job. This was also the time I made some good friends who I hope will last this lifetime, I had my first tryst with love, I learnt to appreciate good books, good music and good cinema (as opposed to their more popular equivalents), I realised my deep and lifelong love for my city Calcutta, and a lot more, not necessarily scandalous, that I rather not recount here at this blog of mine. 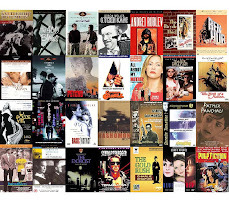 So, without further ado, let me present what counts in my opinion the 100 best movies of the first decade of this millennium, or more appropriately, the 100 best of what I have had the utmost pleasure of seeing till now and being immensely enriched by. 63. The Motorcycle Diaries (Argentina, ’02) – Walter Salles Jr.
Disclaimer: If a movie you feel should have been there in the Top 100 isn't there, it means either I haven't watched it (e.g. Russian Ark, Three Times, Tropical Malady, etc.) or it failed to make my Top 100 (e.g. Kings & Queen, Gosford Park, 3-Iron, etc.). What a wonderful list. I'm especially pleased to see many films from Kim Ki-Duk, Chan-Wook Park and Wong Kar-Wai have made your list! Your number one is definitely one I might not place so highly, but I understand how one might love the film as much as you here. 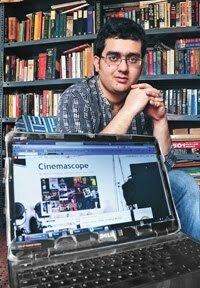 I will definitely have to check out some films from Rituparno Ghosh, seeing his films placed so highly among great films. Happy to see 'Malena' name in the list. The beauty of teenage love is never potrayed as realistic and charming as in malena. Thanks for the list. Thanks a lot for the appreciation and the kind words. 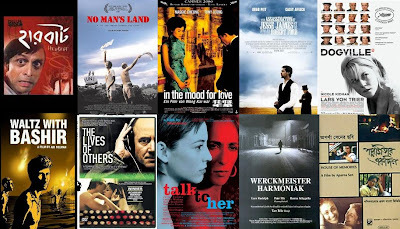 Yes, I'm quite an admirer of Wong Kar-Wai & Park Chan-Wook, as well as Kim Ki-Duk. 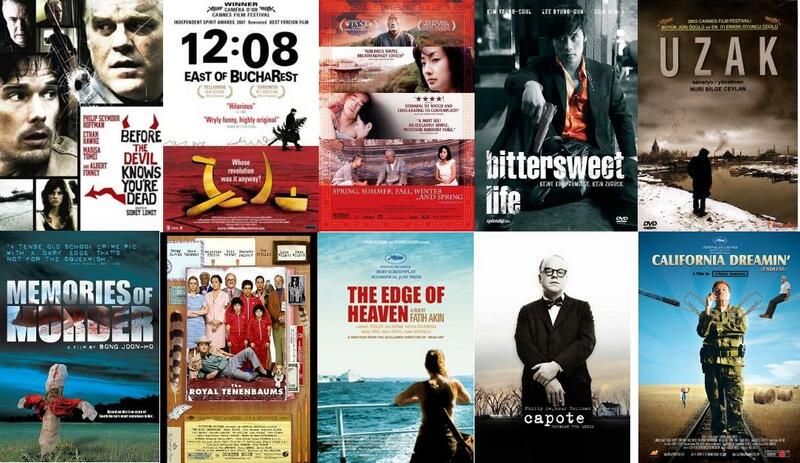 In fact I love the Romanian New Wave films too and hence they too featured in my list. 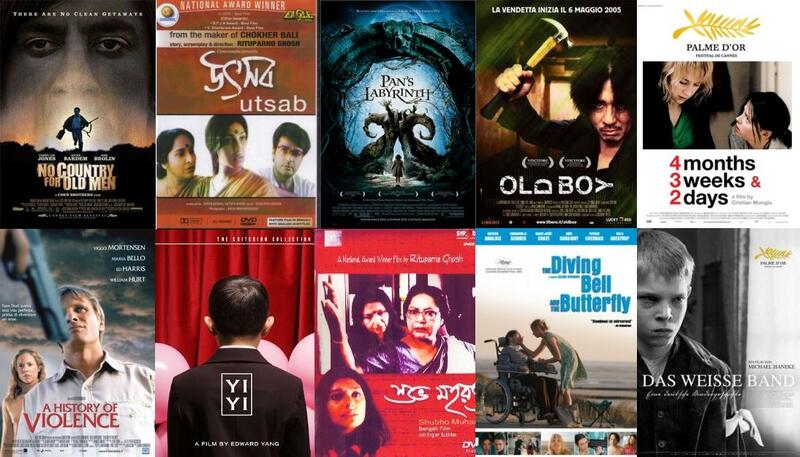 As for Rituparno Ghosh's films, I just love them. I feel he's one of best contemporary filmmakers in the world and an auteur in the truest sense of the term. 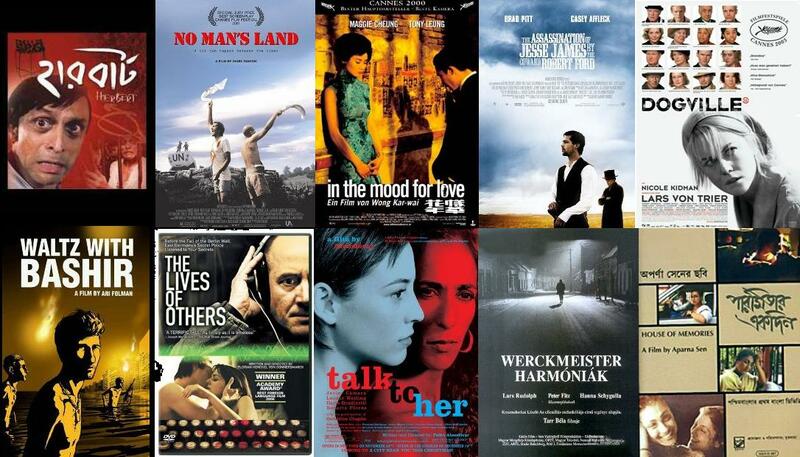 Do let me know if you'd like me to suggest a few of his films to you. Malena has received a lot of mixed reviews on its release. But the film moved it, and that, I can assure you, is a rarity. Thanks buddy. Wow. I'll be coming back to comment on the list shortly. But a cursory glace surprised me. No love for Into the Wild?! Excellent list. We both agree Pan's Labyrinth should be rated so highly. I have it in the same spot in my best-of the decade. It's also great to see so many films that haven't turned up in the majority of more mainstream-orientated lists (mine included). 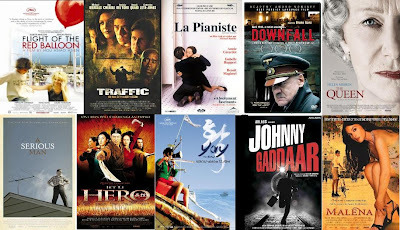 Several films I must check out. Well, it's certainly a list of scope, diversity and exquisite taste, and it does correspond with our presently-winding-down countdown at WitD, where I do believe it has already posted, or will shortly. You are in your Golden Age indeed my friend, and the movies you've seen during this period will always have a special place in your heart decades down the road. Needless to say there are a number here that are among my own particular favorites, and I hope to say more on this in the upcoming weeks. That's quite a bold choice there with NO COUNTRY for #1, but I dare say you are not alone in the critical concensus. It a labor of love. Thanks buddy, I'll be looking forward to a more detailed response from you. I did like Into the Wild even though it didn't make the top 100. Thanks a lot Dan. Great that you agreed as regards Pan's Labyrinth's high finish in my list. Lot of people have praised the film a lot, yet I was disappointed to see a lowly finish for the film in most of the best of the decade lists. By the way, I tried getting hold of you list of best of the decade at your site but couldn't get hold of it. Do provide me the link for the same. Thanks a ton Sam for the appreciation and for your detailed appraisal of the list. I'll be posting it at WiTD's '2000's countdown' poll section shortly. I guess you're right, down the road this decade shall hold a special place in my heart. 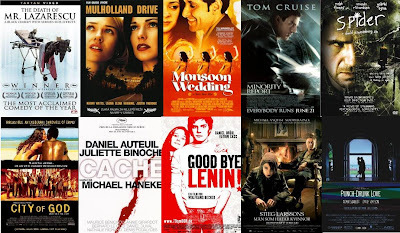 More so given that I've watched most 'good' movies that I've watched so far, if you know what I mean, this last decade - movies which turned me into a cinephile (or was it the other way round?). Thanks again Sam for your generous response. Well, this is such a surprising list (and I'm saying that as a compliment). Probably the only list that would include Death Proof! 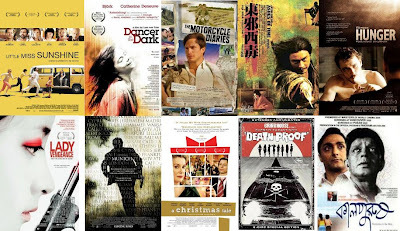 How ever did you find the patience to link every movie name to its review? Terrific stuff. NCFOM at #1 is a real stunner. I didn't think it was THAT dear to you. Same case with Pan's Lab and The White Ribbon. Congrats for finishing the 2000's trip in such glorious fashion. Thanks a lot for that JAFB. NCFOM, as you've so appropriately abbreviated given the huge title, does happen to be extremely dear to me, as its position duly suggests. I even read the book which I took I liked a lot and have even reviewed for Culturazzi. Nice list. There's a few on it that I didn't particularly like, or, at least, not as much as you did. But a great deal of the titles would most probably make my own list. A few of my favourites which didn't make your list -- I don't know if you've seen them -- Good Bye, Dragon Inn; La Ciénaga; In the City of Sylvia; Café Lumière; Somersault; Ten; Daily Bread; Vendredi Soir; and probably a few others, but these few come immediately to mind. Thanks a lot Iain for sharing your views. 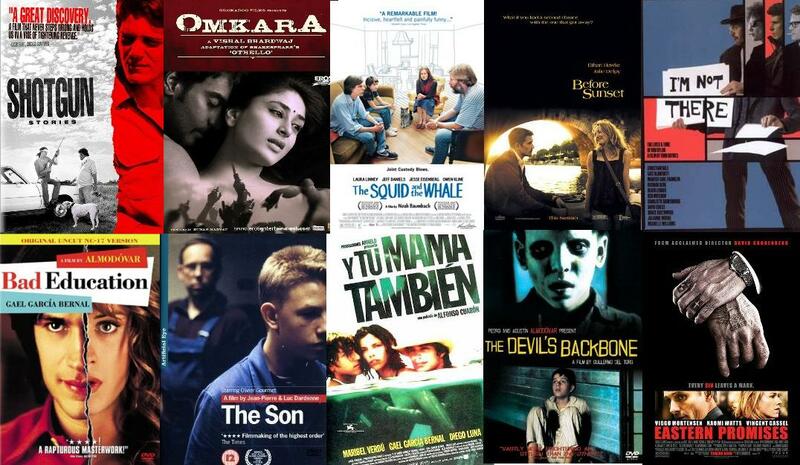 I had set upon myself the target of watching the acclaimed films belonging to the last decade before making the list. However, due to various reasons I couldn't watch as many as I'd have liked to watch, including a few of the movies you've mentioned. So I guess this was the best I managed to come up with amidst various other commitments. By the way, have you posted your best of the decade list? I would very much want to see it. I've not posted an official list, but I drew up a top 15 for Miradas.net -- and I put together a top 20 in the comments section of another blog. Thanks Iain for providing the links. I'll go through them shortly and try fill up the gaps in my viewing. Wow, great list. I'm currently working on my own list of my 100 favourites from the last decade and there's definitely quite a bit of overlap. Thanks a lot. I'd be really interested to see your list once its up at your place. For starters, I'm sure Oldboy is going to make your list too. We were terribly envious and salivating with unfulfilled desire when we saw your list. To have seen all these good pictures and then some as you did, we would have been over the moon and Saturn too! Is there any film that you're still searching for until now? That you're really dying to watch but haven't found yet? For us, it is Terrence Malick's 'Badlands'. On a more serious note, thanks a lot for the good words. Yes, I've been fortunate to have seen some good movies, though there are far too many that I'm yet to watch and enjoy - Truffaut's complete Antoine Doinel series (I've just managed to see 400 Blows from that series), a lot of Jiri Menzel & many other Czechoslovakian films from their New Wave years, etc. As for Badlands, I've fortunately watched it, and can safely say that it deserves to be in you must-see list. Awesome list of both English-speaking and international flavour. Good idea, thanks for sharing, many foreign-language recommendations here I haven't seen. I realize its subjective, but here are some titles I feel are missing from your 100 of the decade: About Schmidt, After The Wedding, Boy A , Control, 25th Hour , Henry Pool is here, Home(2009), Meet The Parents, My Life Without Me, Notes On A Scandal, Sideways, The Hours, The Fountain, The Reader, Paradise Now , Requiem For A Dream, The Return(2003), Avatar, Best of Youth(admittedly a kind of mini-series) , and others. You should check the above out, if you haven't seen them already? Thanks a lot for the appreciation. I'll fight to death for all the movies I've included, including the ones that you singled out, as I'm sure you would for the movies that didn't make the cut. As you said, its extremely subjective and that's really the beauty of the whole exercise, isn't it? Just for the record, Paradise Now & Requiem for a Dream didn't make it by a whisker. I liked Reader though didn't love it. And I don't particularly care for Avatar much - it was nothing more than a big-budget bonanza & popcorn churner. Thanks a lot visiting, and count me in as a reader of your blog too. I'll check out your movie recommendations shortly. For the record, 'Avatar' would be near the end of my 100, but I do feel people kind of got on the bandwagon saying Avatar didn't have a strong plot(I'm not saying you did this). Well, to be honest, Avatar didn't challenge me as a viewer. Neither did it unsettle me or enlighten me or exhilarate me. And not to mention of its wafer-thin plot, predictable developments and one-dimensional characters. Nonetheless, I also appreciate the fact that Avatar was liked & admired by a lot of folks. And hence I respect your opinion about it. I'll check out the essay on the film at your place. We're going to keep searching for 'Badlands'. Hopefully it won't dissapoint us when we do get our hands on it. It is really annoying for us actually to live in a part of the world where shops decide to keep copious DVDs of 'Zorro' but when it comes to classics like 'Badlands', they have never even heard of it. We'll keep our hopes up though and with your stamp of approval on the film, we shall seek it high and low buddy! I strongly feel that Badlands won't disappoint you, provided of course you have an inclination towards lyrical & leisurely-paced movies. And its gorgeously photographed. And yes, the movie does have my stamp of approval, though I don't know if that carries much weight. By the way, which part of the world do you live in, if I may ask? What a wonderfully diverse list. 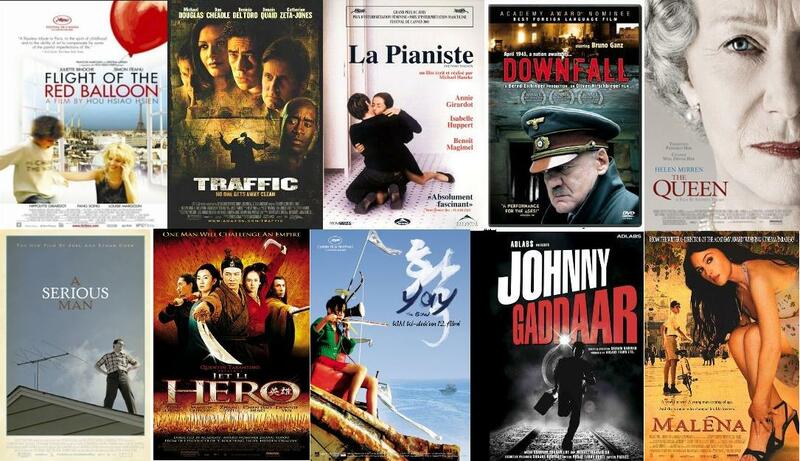 I love that there are so many foreign films on here. Some I'm familiar with and many i've never even heard of. I was also shocked to see "The Savages" a film that I really enjoyed but remember thinking I probably wouldn't revisit again for years. Thanks a lot Heather. Well, I'd tried to make the list as encompassing as possible by watching a lot of movies before making the list. 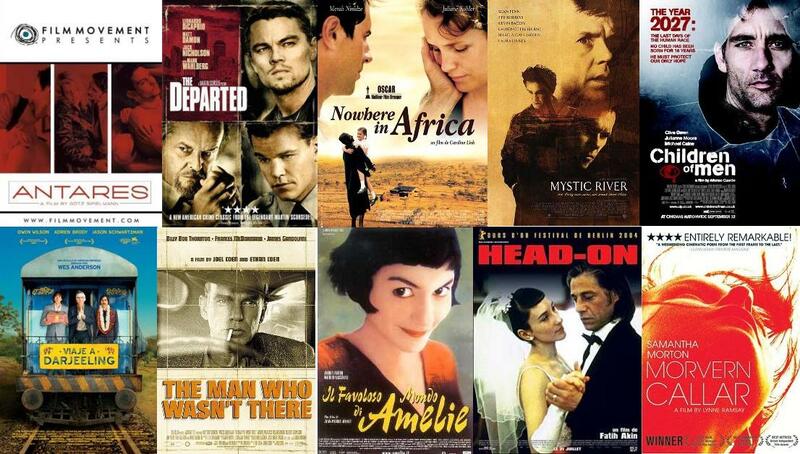 Of course, there are a horde of acclaimed movies that I didn't. Yeah, I really liked Savages. Glad that you liked it too. Even if I can not completely comprehend the rationale of your decision of keeping your identity and nationality hidden from others, I certainly do respect this decision of yours. So rest assured, I will henceforth refrain from asking you any untoward questions that might put you at a false position, and take you solely as a nameless movie-loving friend. And as for this being the only movie blog you keep coming back, thanks you very much for the honour and friendship. Cheers!!! Insane! I simply could not do this. I just looked at the list I made of 49 good films from the aughts. I couldn't find the strength to rank them, let alone I'd probably change the contents from 7 months ago. Good work. A great resource. I still need to find my entrance to films from India. I know you're only being too modest, Sitenoise :) Thanks a lot though for the good words. As for Indian films, you may consider starting off with the works of a contemporary director called Rituparno Ghosh. That's an excellent list. Many of my favorites right from the top of the list (4 Months, 3 Weeks, 2 Days..., A History of Violence, Zodiac, Talk To Her (my movie of the decade))to lower down, films like The Savages, Traffic are there. Even Eastern Promises which has been left out of many lists is there. It seems a bit of our tastes is similar. Assasination of Jesse James, Death Proof, Munich! 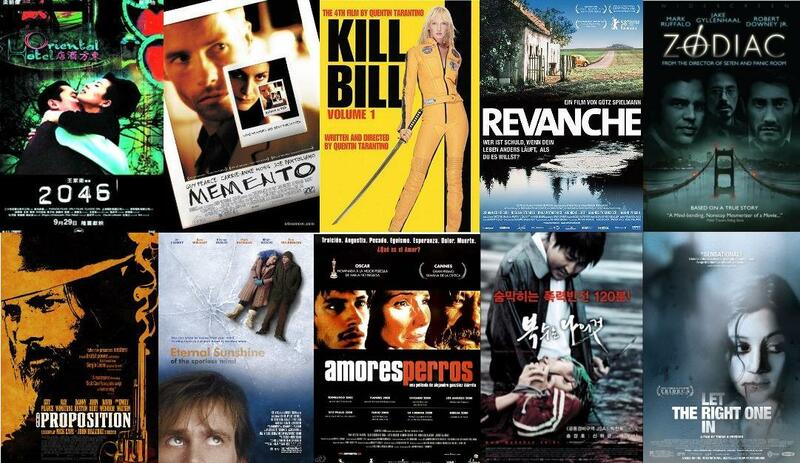 Every where I see, I find films I really love. I see Before the Devil Knows You're Dead is there too. OMG. I have a few of those films in my 'immediate to-watch' list including the highly ranked White Ribbon. I guess I will have to keep this list as a ready reckoner to watch more films from it. Movern Callar is a movie I am always told to watch but I have inevitably ignored it. I will keep an eye out for it. 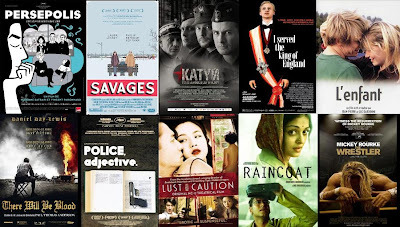 Regarding Rituparno Ghosh - I have watched Raincoat (which I loved) and The Last Lear (which I wanted to love but couldn't but I think it needs a re-watch). I will take time out to watch some of his films as well, probably Dosar and Abohoman. Thanks Pratyush for the detailed response. Glad to hear that a number of your personal favourites are there in my list as well. As for Rituparno Ghosh's films, do look out for Abahoman and Dosar, along with Utsab, Shubho Mahurat, Dahan & Asukh. I'm sure you'll love them. Watch high quality movies with showbox app a premium movie viewing platform. 4K movie quality gives users a lot of hot movies. The good platform that showboxvpn brings to everyone!